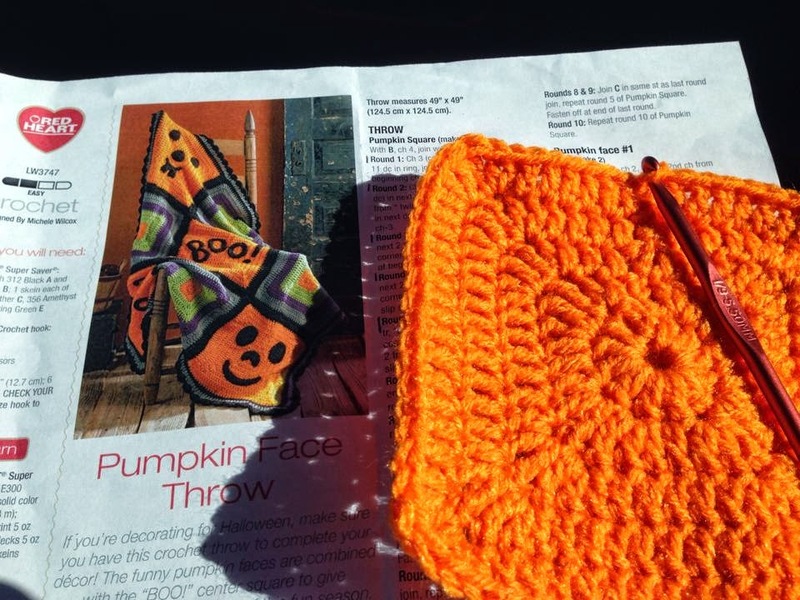 I started making this Pumpkin Face Throw (a free pattern from Red Heart) because I had a lot of vehicle passenger time when my husband and I recently took a quick trip to visit my BFF from high school. I wasn't entirely sure what I was going to do with it when I got finished, but the squares were very easy to make and worked up quickly enough, so it was perfect for working on while traveling. Somewhere around hour number four of our trip, it dawned on me that I was making these squares up so quickly, I could probably crank one of these throws out every month or so just working on them in my spare time. That got me to thinking about who would love to receive a piece of handmade love and my mind instantly went to our deployed servicemen and women. 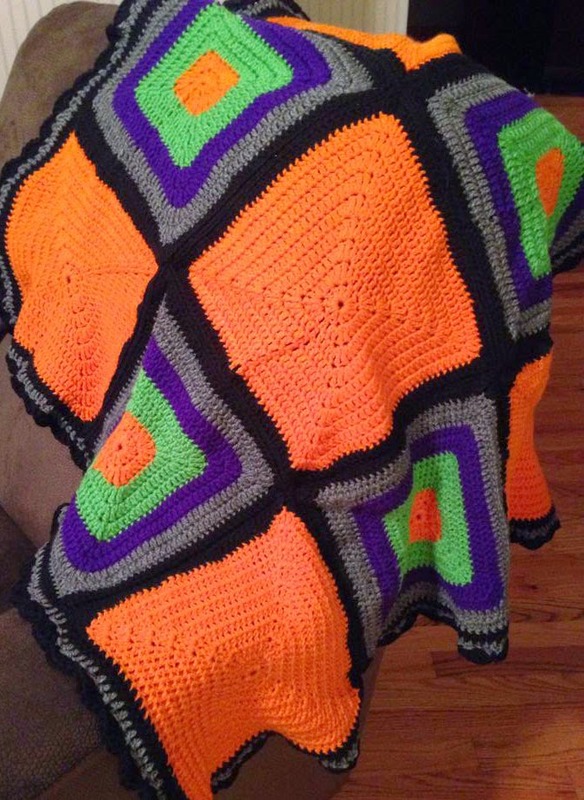 I finished my throw last night and am sending it out tomorrow to a soldier who can use a little pick me up. As a military mom myself (my youngest son is active in the U.S. Army) and a member of the Military Mama Network, I know how important it is to our troops that they know we support them and appreciate their sacrifice for our country. The very least I can do is send them something to remind them of that while they are so far away from home. That is why I've decided to coordinate an effort to gather squares from around the country - or even the world! - and put these throws together, working with the Military Mama Network to identify servicemen and women who are needing some love. If you'd like to contribute squares for future throws, please click here for instructions. About a month ago, I was between projects, waiting for yarn I had ordered for my next project to arrive. 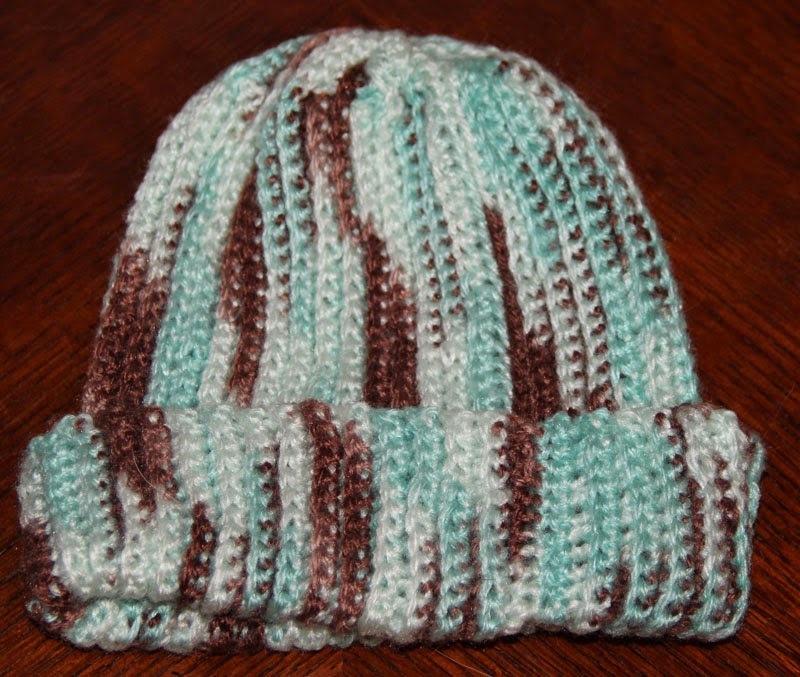 So I figured I'd grab a skein from the yarn stash and make up a hat. I just wanted an easy and free crochet hat pattern. Searching around the Internet, I landed on a Ribbed Crochet Hat Pattern that looked easy enough. It called for worsted weight yarn, but I had some Red Heart Baby TLC yarn that I had bought on a whim when it was on sale and really wanted to try, so I used that instead even though it's sport weight yarn. Well, of course, that made working up this pattern feel like it was never going to end. I finally decided to finish it off even though I knew the hat size would be rather small and fit for a toddler. The hat actually turned out really well. Cute enough, for sure. 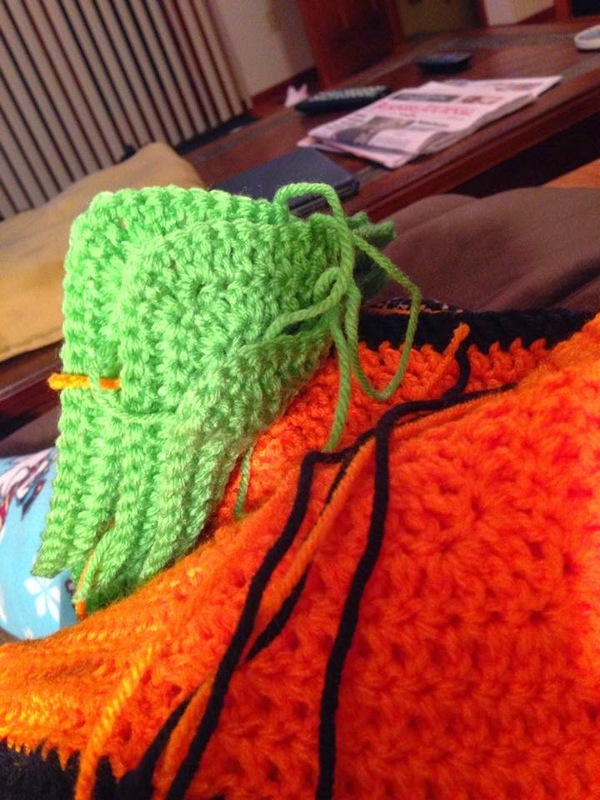 And will make some toddler all snuggly warm this winter. At some point during my down time, I had to run out to Joann and pick up a couple of quick supplies. Like I normally do, I walked through the yarn rows. Because, you know - YARN! I focused on the Red Heart With Love yarn and I think literally fell in love. I decided I wanted to work on a pumpkin hat since it's fall and all, so I picked up a couple of skeins, one mango, one evergreen. 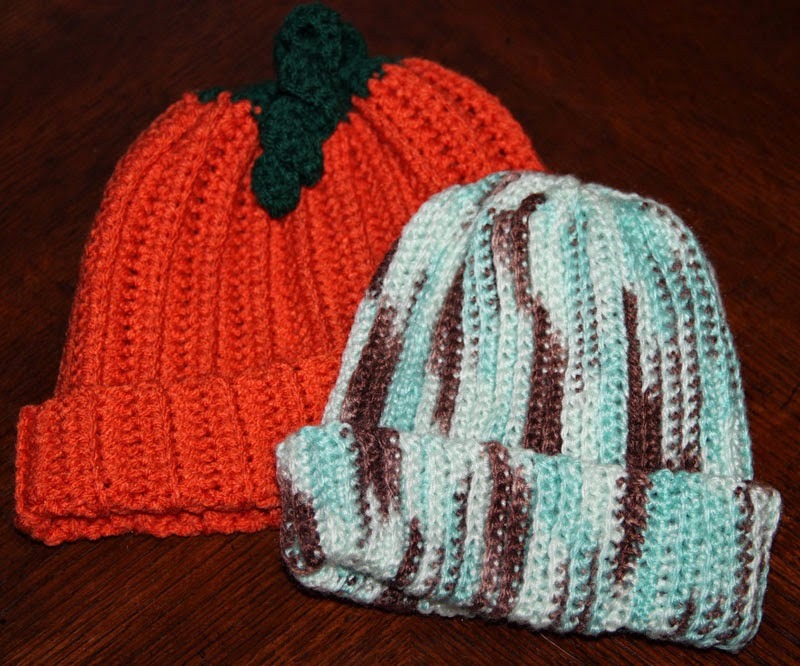 When I got home, I started the search for an easy and free crochet pumpkin hat pattern. 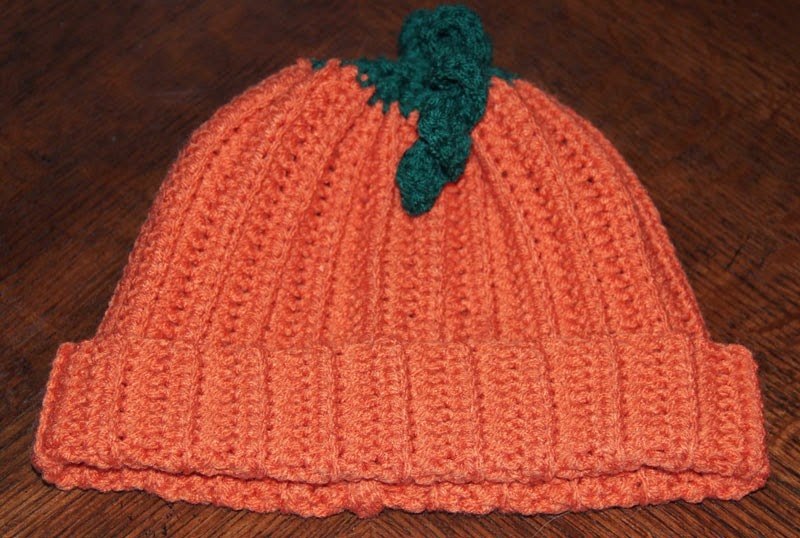 I found a really nice pumpkin hat with a cool looking stem called Ribbed Pumpkin Hat Pattern. It worked up quickly and I really love this pattern. The only problem I have with it, though, is it seems a little bit tight for an adult, or even an older child's head (I had my grandsons try it out!). That might be because I tend to crochet rather tightly so when I try this pattern again, I'll increase the length of the original chain, and then increase the number of rows because I like my winter hats to be a little bit on the loose side. All in all, I'm really happy with the final outcome.